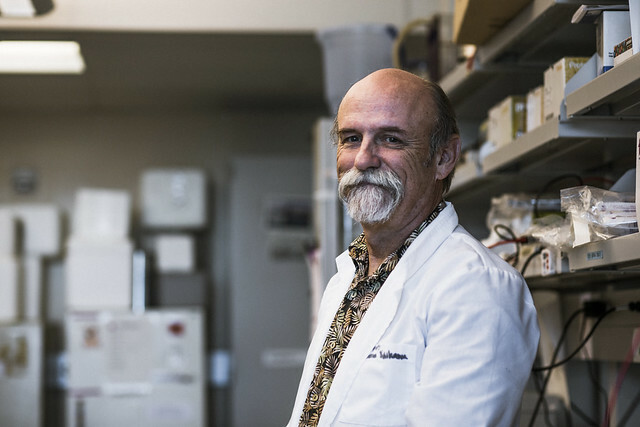 Pictured: Dr. Robert Nichols in the lab at the Biosciences Building at the John A. Burns School of Medicine. Deborah Manog Dimaya photo. Recognized by its ability to steal memories and target the aging population, Alzheimer’s Disease has long been without a cure — but a University of Hawaiʻi – Mānoa (UHM) Scientist hopes to change that. What’s new: Large amounts of the peptide “beta amyloid” are known to trigger Alzheimer’s Disease but UHM medical researchers have discovered that a non-toxic fragment taken from the same peptide can actually protect the brain’s nerve cells. Moving forward: Dr. Nichols and his team are collaborating with scientists at the University of Arizona to develop a future drug candidate, based on the non-toxic peptide fragment. 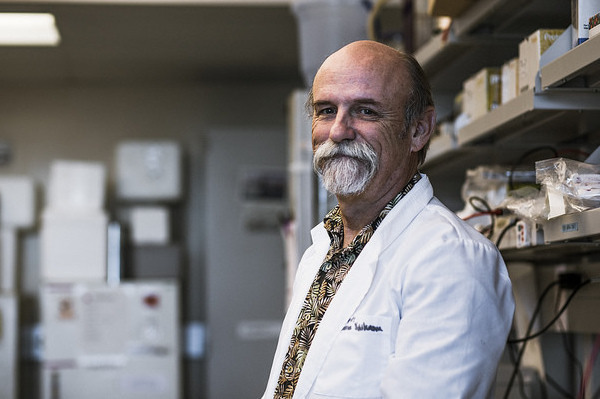 The research of Dr. Robert Nichols, Professor of Cell & Molecular Biology with the UHM John A. Burns School of Medicine (JABSOM), and his team of collaborators caught the attention of the Journal of Neurochemistry and was published in January. The study demonstrates that a small string of six amino acids derived from a larger peptide called “beta amyloid” can be used to protect nerve cells in the brain from Alzheimer’s Disease. Interestingly enough, buildup of the larger beta amyloid peptide is known to trigger Alzheimer’s Disease. During the course of the disease, nerve cells in certain parts of the brain deteriorate, which leads to common symptoms like increased memory loss and confusion. However, Dr. Nichols showed that application of the small protective peptide was observed to restore both normal functioning of nerve cell communication and normal memory processing. Dr. Nichols says that up until now, most of the work that’s been done to combat the destructive effects of Alzheimer’s Disease has been to try to lower the levels of beta amyloid in the brain, which has not proved to be an effective treatment to stop or slow the disease. “We believe this is an exciting, new approach because we are trying to modulate how amyloid is actually acting and causing toxicity in the brain rather than simply lowering it,” Dr. Nichols said. Alzheimer’s is the sixth leading cause of death in the United States, Alzheimer’s Association reports. In Hawaiʻi, the number of people ages 65 and older affected by this disease is expected to rise 25% by the year 2025. Currently, Dr. Nichols is collaborating with scientists at the University of Arizona to design and screen compounds based on the peptide fragment, for future drug development. Kelly Forest, Senior Graduate Student in the PhD program in Cell & Molecular Biology – Neuroscience, JABSOM and Naghum Alfulaij, PhD in Cell & Molecular Biology – Neuroscience, JABSOM. Komal Arora, PhD, Postdoctoral Fellow in Cell & Molecular Biology – Neuroscience, JABSOM; Ruth Taketa, Graduate Student in the MS program in Cell & Molecular Biology – Neuroscience, JABSOM; Tessi Sherrin, PhD, Postdoctoral Fellow in Cell & Molecular Biology – Neuroscience, JABSOM; Gene Yoshikawa, third-year medical student at JABSOM. Victor Hruby, PhD, Regents Professor, Chemistry & Biochemistry, University of Arizona; Cedomir Todorovic, PhD, Assistant Researcher in Cell & Molecular Biology, JABSOM; Ho-Leung Ng, PhD, Assistant Professor of Chemistry, Kansas State University; James Lawrence, PhD, Assistant Professor, Hawaiʻi Pacific University. Funding provided by UH Foundation and NIH grants. To support a program or area at JABSOM of special interest to you, please contact Director of Development Elaine Evans at 808-692-0991 or elaine.evans@uhfoundation.org. Read the transcript from the video.